Today's activity requires a more elaborated work: you must choose a community that lives in extreme weather conditions (see the list below) and do a reseach (.ppt format), as complete as possible, about their way of life. You can (must) add maps, graphs and pictures. - Environment and climate: Where do they live? How is the climate and the landscape in which they live? - Life: How do they live? (Economic activities, housing, food ...); How do environmental factors influence their clothing and ornaments? Why is it said that they represent one of the most extreme cases of human adaptation? - Problems and adaptation: Have they experienced any kind of marginalization? Which one? Have they changed their traditional way of life in recent years? How? Why? Has it been a positive or negative change? Why? What problems do these people face nowadays? - Conclusions: your opinion about the chosen community. What have you learned or has called your attention? - Webgraphy (links to websites consulted) and Credits (which section was done by each team member). When finish, send your work, as attached file, to blogeducativo08@gmail.com. As usual, you will do a oral presentation at class. This work will be part of the score at the end of the term. If you fail to finish them or you give it out of date, the mark will be a 0 for this work. 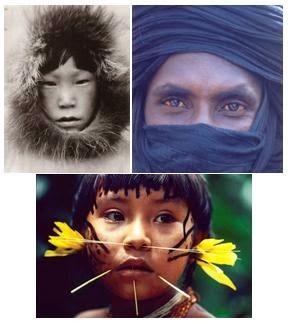 - Life in the Amazon: the Yanomami (Brazil). - Life in the heights: the Sherpas (Nepal), well known among mountaineers.